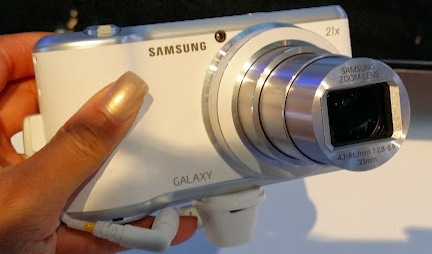 Samsung is attempting their second Android smart camera with the Galaxy Camera 2. I checked out the camera, snapped some pics and got the spec run down. The Samsung Galaxy Camera 2 came out a few days ago. I was excited when I figured that I would get some hands on time with it at CES. I actively use the original version of the Galaxy Camera, mostly because of its zoom and social media sharing capabilities. The original Galaxy Camera is large and a bit awkward to hold. The second version is about the same size. It looks a bit more sophisticated with the leather looking plastic coating. Besides a bit of the look, much hasn’t changed. 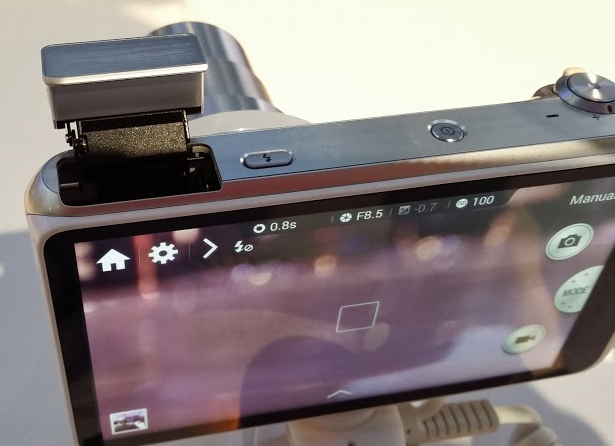 The camera uses Android Jelly Bean 4.3 as the operating system. It feels a bit lighter on the hands. I’m assuming that it should be a bit faster since the processor has been upgraded. That seems to be about the only major change done to the camera besides a larger battery. A great incentive is the 50GB of Dropbox cloud storage you get when purchasing the camera. Samsung Electronics Co., Ltd announced the Galaxy Camera 2, a successor to the award winning GALAXY Camera which combines the quality imaging of a high end camera with sharing capabilities and an intuitive design to match the most up-to-date smartphones. The Galaxy Camera 2’s revolutionary technology, which includes an upgraded 1.6GHz Quad Core processor and the Android platform makes it faster and easier than ever for users to shoot, edit and share high quality images with friends and family. With a lightweight, retro design, the Galaxy Camera 2 is the ideal option for photographers who do not want to sacrifice style for technology. The Galaxy Camera 2’s 121.2mm (4.8-inch) HD Super Clear Touch LCD provides users with a beautiful way to view and edit images. Shots are displayed in intense color and detail, while its large size makes it easy to navigate the many apps and features available on the camera. With a lightweight design, the Galaxy Camera 2 is a highly portable option making it the perfect choice for both day to-day, as well as special occasion photography.